here are a few items in the cleaning/touch-up-polish-with-fabulustre stage before they go into the shot polisher. Sterling silver large hammered cuff bracelet – 6 1/4 inches long, 1 inch wide and 2 1/8 inch wrist. Unique edge with basket weave and cross-peen oxidized pattern M/F. Hand made by yours truly. USPS Priority shipping insured with delivery confirmation in continental US is included in the price. Sterling silver bola leather bracelet with cast pollen, toggle and keeper – 7 1/2 inches. A touch of Science, the West or Southwest for any outfit M/F and absolutely one-of-a-kind for the botanist, allergist or forward-thinker. Sterling silver bola leather bracelet with cast toggle and keeper – 7 1/4 inches. A touch of the West or Southwest for any outfit M/F. 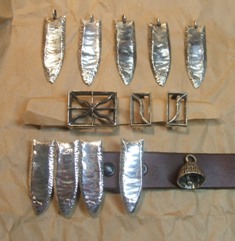 original Marshall Hansen Design cast Sterling Silver buckle set in hammered or bright finish 2 inches long – fits 3/4 inch belt. Sample leather not included. Bright and vibrant cross-peen hammered sterling silver bangle. Approximately 1/2 inch wide with 2 3/4 inches opening. These sparkling hammered finish fish bone earrings are one of my favorite designs and would make a great present. Sterling silver, about 2 1/4 inches long and 5/8 inch wide and made in the MHD studio. $55 USPS Priority shipping insured with delivery confirmation in continental US is included in the price.